Prominent & Leading Manufacturer from Mumbai, we offer hund h 600 polarizing microscope. While mounting the tree of victory, it has become progressively more important for us to present a quality Hund Polarizing Microscope. Solid, heavy cast-metal stand, rectangular shape for high expandability. Max. stability for smooth microscopy. Coaxial coarse and fine focusing. Height adjustment of the coarse drive 22 mm (total). Height adjustment of the fine drive 2 m per scale division. Mechanical stage 160 mm x 130 mm with ergonomically placed coaxial knobs. Specimen holder with spring lever. Condenser height adjustment with gear drive for exact adjustment according to Kohler. Sophisticated illumination tube with centerable field diaphragm. 12 V / 30 W halogen illumination with continuous brightness control. 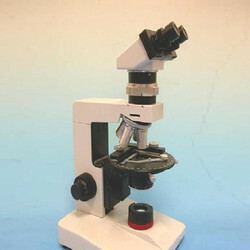 Looking for Hund Polarizing Microscope ?